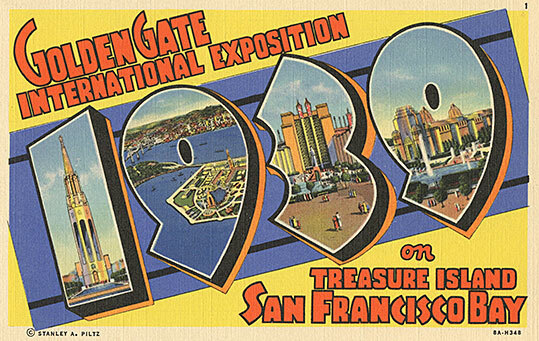 Visit the 1939 - 1940 Golden Gate International Exposition through picture postcards, photographs, and videos. This ongoing exhibition, located on San Francisco's Treasure Island, was organized by the Treasure Island Museum and can be viewed at The Winery-SF and the Treasure Island Museum Gallery. The exhibition features postcards from the collection of guest curator Kathryn Ayres, Vice President of the San Francisco Bay Area Post Card Club, as well as from the collection of the Treasure Island Development Authority. In the galleries, visitors experience the fair through about 150 picture postcards, brochures, the Official Guidebook, vintage footage of visitors attending the fair, and video interviews of people who remember attending the fair. Hours are subject to change, so please check our calendar before coming. The exhibition and all events are free and wheelchair accessible. Donations to Treasure Island Museum Association are tax-deductible.